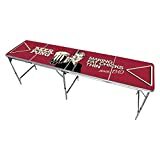 We’ve all been at someone’s house or apartment when the red Solo cups and the folding table come out for an impromptu game of beer pong. But you don’t have to pull that old folding table out of storage or clear off the dining room table. 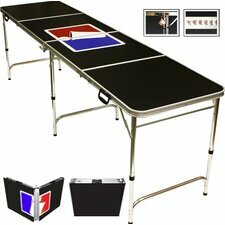 Instead, get yourself a good beer pong table – one that is designed solely for this purpose. These things are standard regulation size and surprisingly durable. 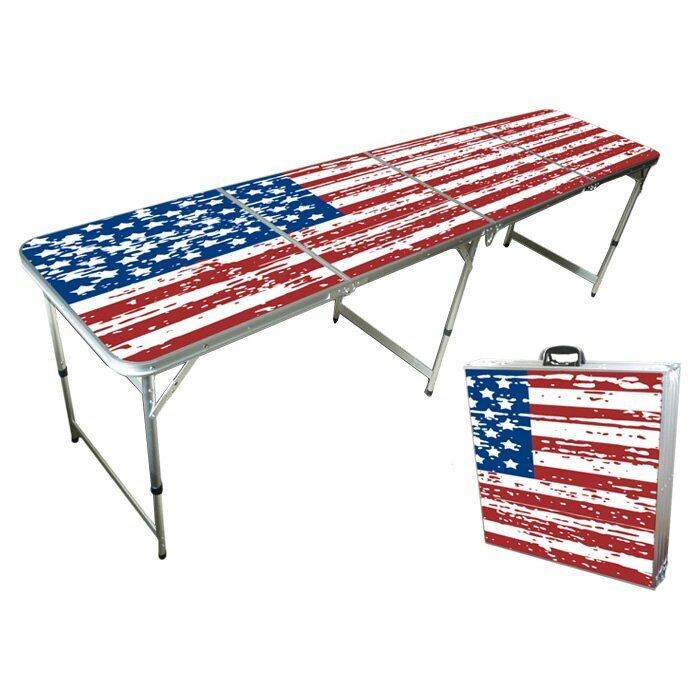 If you’re ready to take the plunge and make yourself the proud new owner of an awesome beer pong table, then let us help you pick the perfect one for your backyard party, frat house and tailgating needs. Whether you’re just a hobbyist or a long-time player of the game, let us help you find a good option to meet your needs. 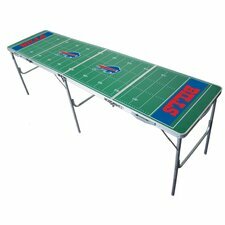 Whether you need a good beer pong table for cold weather tailgating or backyard fun with the guys, we can help you out. Feel free to click on any of our recommended models for more information, or keep reading for details on specs and features to look for when you’re out shopping for one of these. Are you just a casual player of this drinking game? If so, then a table made just for playing it likely isn’t a good choice for. However, if you play when tailgating, at cookouts, the Greek house, and other get togethers with friends and family, then why not get one of these? It’s a good investment that will making the game more fun for everyone. Standard regulation size every time you play. 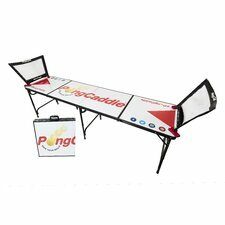 More durable than your average folding table. Durable construction means you get something that lasts for years. As you shop and consider some of our recommended models, know that the best models tend to be regulation size and come with a protective coating to ensure that the surface doesn’t get damaged from spilled beer. Even the cheaper models tend to be a better choice than a regular folding card table. First things first, definitely make sure you opt for a regulation size model. This way, if you ever decide to take part in any tournaments you’ll already be used to playing on the proper size tables. 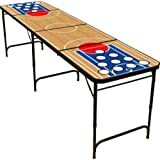 According to the Word Series of Beer Pong (WSOBP) rules, proper dimensions for regulation-size tournament play is 8-foot by 2-foot by 27.5-inches. (One thing to keep in mind when it comes to beer pong rules is that house party rules are a bit different). Does it have a waterproof coating? Let’s face it, when we play beer pong, we end up spilling almost as much beer as we chug, right? That’s why a protective coating is so important. Go with a model that has something like a melamine coating to protect from beer spills and prevent warping of the surface when that beer gets on the table’s surface. This feature should really be non-negotiable because your table’s surface WILL get wet from the liquid. Some of the models on the market some with custom balls. Personally, this isn’t really a deal-breaker feature for me, but some of the more serious players I know prefer to have custom balls for when they play. So, if that’s important to you, then know that some models do offer it. If you plan on taking this baby out tailgating, or even over at friends’ houses, then you need a model that folds up for easy portability. Of course, you’ll find that many of the models do fold up. However, you’ll also want to check the weight cause some of them weigh a lot more than others. And you don’t want to be lugging around extra weight if you don’t have to – you might not mind it on the way to set up, but trust me, after all that chugging you will not like having to carry the table back to the truck! Here’s the thing about taking one of these tailgating – if we’re talking about football season then it gets COLD outside, and that’s not good for some of these models. So, you need to choose one made out of a material that can take the cold weather. A good choice here is aluminum, which can also take the really hot temperatures for those summer baseball game tailgating parties. I know one guy who takes his beer pong games very seriously, and as a result, he is all about the custom designed tables. Personally, I don’t want to spend that much money, so I’m not at all interested in custom design. But, if you’re like by buddy Mike, then know that you can make a custom design happen, if that’s what you want. 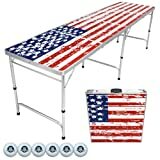 For me, I’m more of a hobby player so a cheap beer pong table is really all I need for a fun Saturday cookout with the guys. After taking a look at the current options on the market, we’ve gone through and selected a few of our favorites to review for you. These are the models that we think represent the best beer pong tables for the money no matter what your budget might be. So, if you’re having trouble deciding which tables might be a good option for your needs, then take a moment to read through our editor thoughts below and see if that doesn’t help you out. 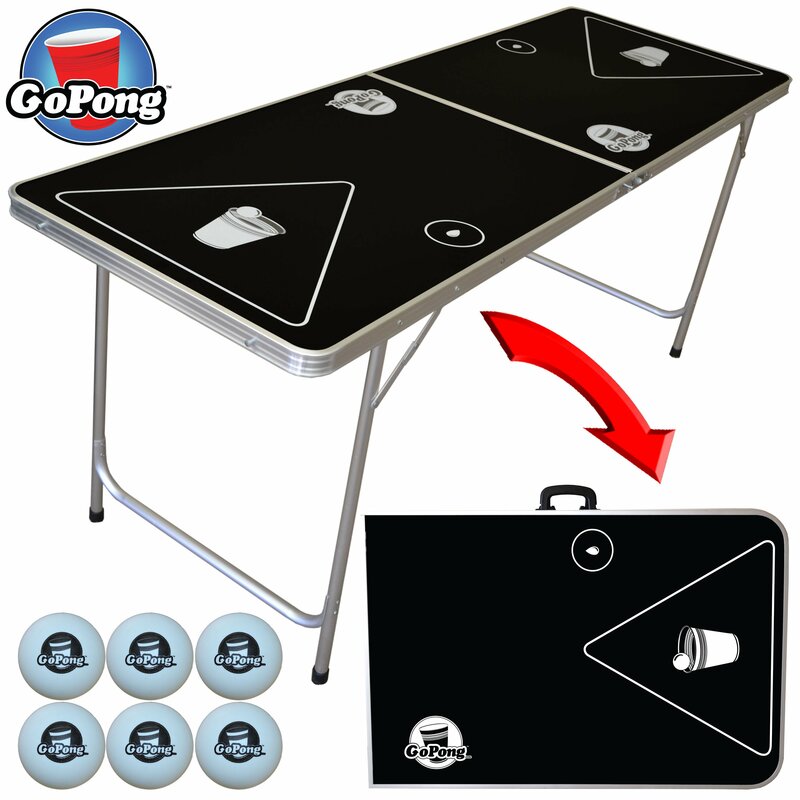 Our favorite option when it comes to cheap beer pong tables under $100 is this model by GoPong. There’s a lot to like about it, so let’s look at it’s top features. As you can see, there is a lot to like about this one. Honestly, it ticks all the requirements from our editors, and does so at a cheap price. The one complaint from our editors is that the legs could be sturdier. 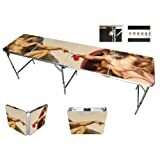 So, if you enjoy slamming down your cups on the table, then this model might not be the best choice for you. Of course, if the legs were thicker and sturdier, then it would weigh a lot more. So, overall it’s a decent trade-off, which is why it’s currently our top pick. 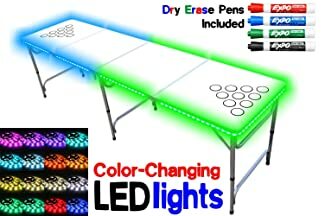 If you’re looking for one of the coolest beer pong tables, then look no further than this PartyPongTables 8-Foot LED Color-Changing Glow Lights Beer Pong Table model. It really brings a little something extra to your games. 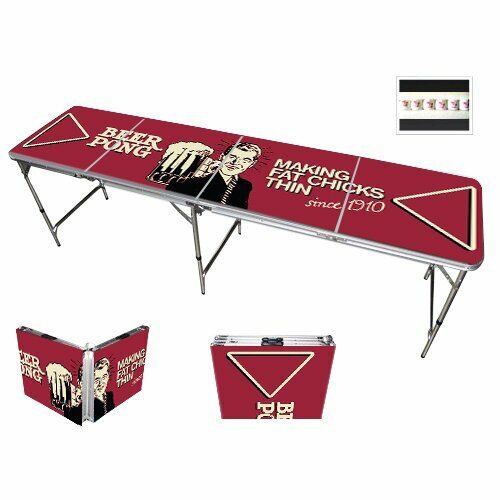 Best of all, there are 11 different designs to choose from – including a dry erase beer pong table! How awesome is that? As you can see, this is one of the coolest options out there right now, especially if glowing lights sounds as awesome to you as it does to us. Our only complaint with this one is that some of the models that have the painted surface are not very good quality. It doesn’t take long until the paint starts peeling off. Of course, this could have been just a fluke with the models we checked, but know that it might happen. 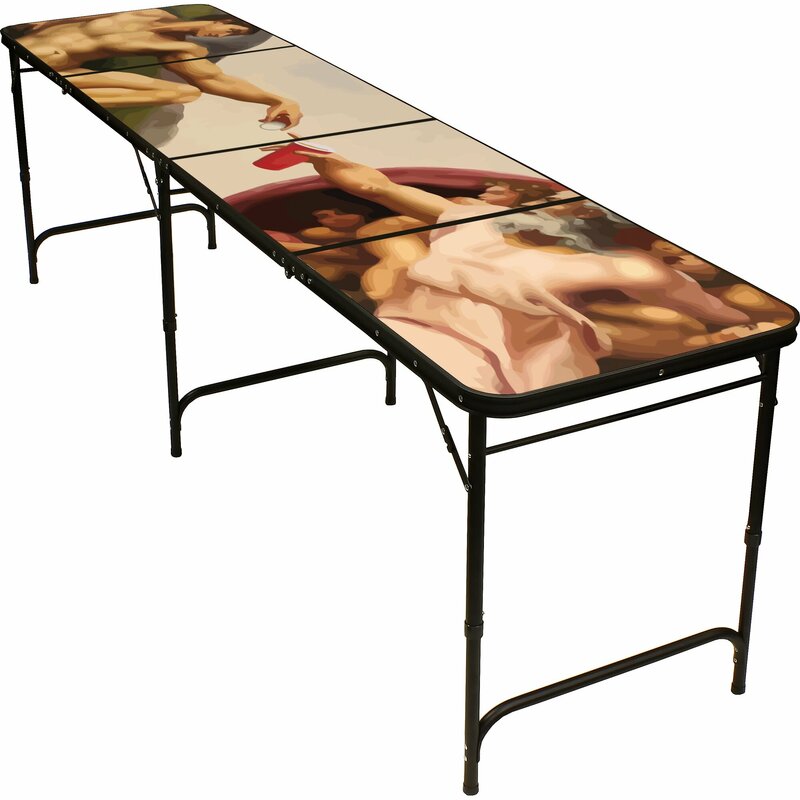 If you’re just looking for something that looks really cool or will be a fun conversation piece, then we suggest you check out some of our favorite models with really cool designs on the table surface. This one is great because it’s made by one of the top brands in the industry and is lightweight and ultra portable. You can fold up to take it tailgating, camping or anywhere else you desire. The waterproof surface keeps it looks great for many years to come. This one is also made by one of the top brands in the industry and is lightweight and ultra portable. Plus, it has this funny design that guys everywhere will get a laugh out of. You can fold up to take it tailgating, camping or anywhere else you desire. The waterproof surface keeps it looks great for many years to come. This one is also made by one of the top brands in the industry and is lightweight and ultra portable. Plus, it has this funny design that art enthusiasts everywhere will get a laugh out of. You can fold up to take it tailgating, camping or anywhere else you desire. The waterproof surface keeps it looks great for many years to come. If you just want to look at the selection that is available online, then let us help you determine where to look for the best selection. 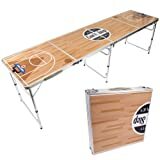 We find that the following online retailers have a good selection of quality beer pong tables. 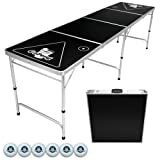 If you’ve never played beer pong before, then you might be looking at these awesome beer pong tables and wondering what you’re supposed to do with them. Luckily, the game is easy to play and you can pick it up quickly. Below we’ll give you some beginner tips on how to play this game. And you need to set up those cups at each end. You have 10 cups on each side, arranged in a triangle with four cups in the row that is closest to the player. Start the game with an eye-to-eye challenge stare down. Make your first shot while doing this stare down. Each player gets to play one ball per turn. When a shot is made into a cup, that cup has to be removed from the table and drank by someone on the team that had to remove the cup. Team members alternate drinking the beer. Shots can be tossed or bounced into the cups. The defending team can block bounced shots once the ball hits the table, but cannot block tossed shots. Re-racks – when there are three or six cups that remain on one side, that side has the opportunity to re-arrange the cups. Re-racks are only allowed twice for each team per game. 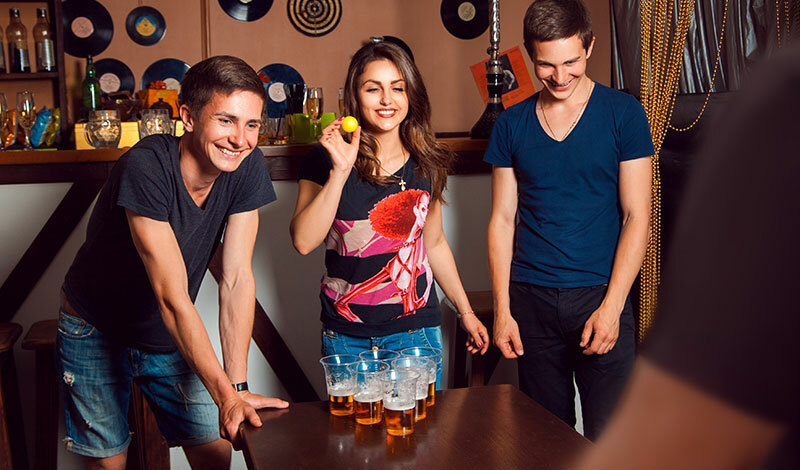 Party cup – When a ball touches the cup, it is called a ‘party cup’ until all the beer is gone from the cup. If the opposing team sinks the party cup, then you lose. Rebuttal – When your team is down to just one cup and your opponent makes a shot, you get the chance to score an save your game from being a loss for your team. Before you gather your friends and start playing, let us share a few tips and tricks for a better game. Make sure you don’t stand close to the table when your opponent is shooting. If you do, they get a better perception of distance. The best technique is a follow through at 90-degrees into the cup that you are aiming at. If you’re playing teams, don’t throw both balls at the same time. When you take a shot, always aim at a specific cup. For a challenge, designate a ‘foul line’ where the players’ bodies cannot pass when making a shot.